Just how much does Mitt Romney love teachers? "I love teachers," he said repeatedly during a spirited exchange in Monday night's foreign policy debate that went off topic, to the annoyance of moderator Bob Schieffer, and delved into teacher hiring policies. But Romney also said he doesn't think the federal government should pay to hire teachers, even at a time when so many school systems have cut payrolls due to the recession. 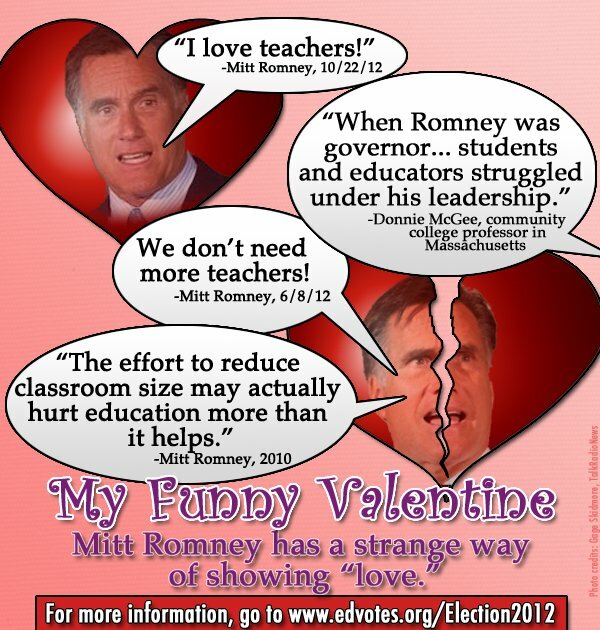 Now, the National Education Association, the nation's largest teachers union, has created a "love letter" for Romney. The graphic, which the NEA is distributing widely to reporters and on its blog, is titled "My Funny Valentine" and features pictures of the former Massachusetts governor framed in hearts. "Mitt Romney has a strange way of showing 'love,'" it says. Several thought bubbles highlight his conflicting comments on education. "I love teachers!" one heart-surrounded Romney says. But Romney in a cracked heart repeats the GOP nominee's June quote, "We don't need more teachers." "The effort to reduce classroom size may actually hurt education more than it helps," another thought bubble says, quoting Romney in 2010. The graphic also quotes Donnie McGee, a Massachusetts community college professor who said, "When Romney was Governor ... students and educators struggled." Shown the NEA's creation, a representative from the Romney campaign declined to comment. The graphic is part of the union's get-out-the-vote efforts, which have so far mobilized 481,000 members to work on initiatives like phone banks, canvassing and voter registration, according to NEA spokeswoman Sara Robertson. "Mitt Romney's form of love reminds me of being on the schoolyard as a kid. The only way you knew whether or not someone liked you was if they pulled your hair or made fun of you in front of their friends," said NEA President Dennis Van Roekel. The NEA, of course, would stand to lose under a Romney policy of no federal funds for hiring teachers. Federal stimulus money saved 420,000 education jobs between 2009 and the 2010-11 school year, according to the U.S. Education Department. A White House report found that between June 2009 and August 2012, more than 300,000 teachers lost their jobs. In August alone, schools cut 7,000 educators from their payrolls. Those losses have hit the union, too: Recent Internal Revenue Service reports show that in the 2010-2011 school year, 25 NEA state affiliates saw declining dues, and 15 ran state budget deficits, as blogger Mike Antonucci noted. Overall, Antonucci wrote, the NEA's active membership declined by 2 percent that year. That trend might soon change in part because of Obama's stimulus plan, the NEA said. In other ways as well, the NEA would have a lot to lose under a President Romney. The GOP nominee has said that he would use the Education Department to fight teachers unions and that unions should not be allowed to contribute to school board candidates. "We're going to have to have training programs that work for our workers and schools that finally put the parents and the teachers and the kids first, and the teachers unions are going to have to go behind," he said in Monday night's debate. [Obama] wants another stimulus; he wants to hire more government workers. He says we need more firemen, more policemen, more teachers. Did he not get the message of Wisconsin? The American people did. It's time for us to cut back on government and help the American people. When his opponents seized on those comment, Romney tried to take them back, saying the idea that he was opposed to hiring more teachers was "completely absurd." Then, during the first presidential debate on Oct. 3, he said, "Well, first, I love great schools. ... And the key to great schools [is] great teachers. So I reject the idea that I don't believe in great teachers or more teachers." Soon after, Romney told The Des Moines Register that Obama's proposal to hire more teachers was misguided and would not result in economic growth. "Hiring schoolteachers is not going to raise the growth of the U.S. economy over the next three-to-four years," he said. Romney: I love teachers, and I'm happy to have states and communities that want to hire teachers do that. By the way, I don't like to have the federal government start pushing its weight deeper and deeper into our schools. Let the states and localities do that. I was a governor. The federal government didn't hire our teachers. ... But I love teachers. But I want to get our private sector growing, and I know how to do it. Romney might be seeking to channel the philosophy of the education reform movement, which argues that simply hiring more teachers won't help schools, but the NEA is attacking him for trying to have it both ways. "The same candidate who claims he loves teachers has opposed efforts to invest in teachers and reduce class sizes to help our kids succeed," said Randi Weingarten, president of the American Federation of Teachers, the nation's second-largest teachers union. "He pays lip service to the importance of teachers, but he's said he would preserve the U.S. Department of Education only so he'd have a club to go after their unions." Obama himself followed up on Romney's declaration of educational ardour the next day. The president asked attendees Tuesday at a Delray Beach, Fla., event, "If you talk about how much you love teachers during a debate but said just a few weeks ago that we shouldn’t hire any more because they won’t grow the economy, what do you have?"